It’s the week of speedy raw lunches! Today’s recipe came to me at random, as I was attempting to prep for a bio lab. I had half an avocado, tons of carrots (I always have tons of carrots on hand for juicing), half a cup of aduki beans that were left over from a batch I cooked up in the rice cooker this past weekend, and…and what? I knew I could throw these all into a salad, but suddenly, it dawned on me: I had a bag of kelp noodles that had been sitting around for quite a while. 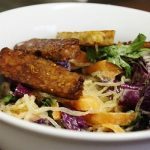 I love kelp noodles because they offer the crunch of salad with the general aesthetic and feel of pasta. And it’s very easy to control how soft or crispy they are. How? Well, when I’m not in the mood for kelp noodles that have a bit of crunch in them (which all of them naturally do), I simply heat a pot of water till it’s quite hot, but cool enough for me to stick a finger in quickly. I turn off the heat, add my kelp noodles, cover them, and let them steam for about ten minutes. I then drain and serve. 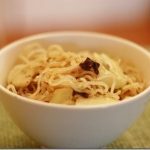 This is a very easy way to make the noodles softer and more palatable, especially if you’re not familiar with their texture. As usual, I’m sure a few of you are wondering where to get kelp noodles. My answer: I order them online, either directly from the Sea Tangle Company or through Amazon. 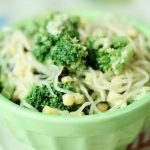 You can find kelp noodles at many health food stores and Whole Foods, but many still don’t carry them, and I find that it’s very easy to simply order a pack of six. They have a seemingly endless shelf life, and I use them often enough that it’s absolutely worth it for me! So: I had the ingredients I needed for an excellent raw lunch. Here’s what I did with them. Blend all ingredients in a high speed blender till smooth. Mix the beans and noodles, and top with about half a cup of sauce. Mix and serve with some fresh greens, vegetable crudites, steamed broccoli, or raw crackers (or a mish mosh of all of the above!). A sprinkle of nutritional yeast is nice here, too. There’s a lesson here: when you’re wondering “what should I eat for lunch,” do a quick inventory of what’s in your fridge. Think about what you can use for a sauce or dressing, what you can use as a protein, what you can use as a source of complex carbs (energy!! 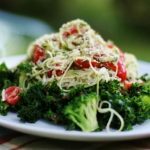 ), and what might work as a “base.” By base, I simply mean whatever is going to take up the most volume in your meal: for me, it’s usually greens (a salad base, for instance), but it’s often also zucchini noodles, kelp noodles, or a grain. Then, think about flavor pairings (carrot, avocado, and ginger are heavenly together), and mix it all up. It’s that simple! Complex recipes are great when you have time for them, but when it comes to making a high raw lunch on the fly, this little “system” tends to work for me. Speaking of time, my blogging time is running short. Till tomorrow, friends! This looks delicious and I will be eating this tomorrow! 1) How many grams is one package of kelp noodles? 2) If I was to substitute gluten-free soy sauce for the nama shoyu…would it be equal measures? Thanks for coming up with and posting recipes when you have all that school work! It is greatly appreciated. I, too, am in school and know that it is hard to balance school with everything else! I have found kelp noodles to have a distinctly fishy taste to them (not surprising! )…do you have any suggestions for removing or masking this? The carrot sauce looks lovely. This sauce sounds so wonderful! I’ve been craving lots of ginger lately and this sounds like it would hit the spot. Plus that avocado.. you just can’t go wrong! I know you love your kelp noodles. I am more of a zucchini noodle fan. Something about the crunchy factor of the kelp I think. But the sauce…nice! Anything that you can blend up and make creamy and rich and it be a FAST endeavor is fab. This is so creative Gena! And it looks awesome! I will definitely be trying this! This sauce sounds awesome! I really love ginger, so anything gingery sounds great to me. And with avocado, too. Yum! Thank you for the great recipe and also for answering my a-few-moths-old question where to get a good quality kelp noodles without any extra effort from my side. Love Choosingraw! Or, if you live in not-America, just dream of making this sauce and eating it with a spoon while you sit in a hotel room after two 14 hour and one 10 hour work days with no access to kelp but a bag of coleslaw mix from the convenience store and a block of Lindt 85% in front of you. 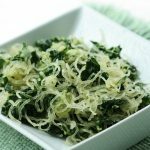 You can sprinkle lemon juice on your kelp noodles,than let them set for half hour .This softens them without having to cook them. You always amaze me with your ability to whip up deliciousness on the fly 🙂 Looks great! Kelp noodle are one of those raw ingredients I just haven’t gotten around to trying yet. I haven’t tried azuki beans. I’ll have to look for them. Great post, Gena! Thinking outside the (lunch)box like this is what makes healthy eating fun and do-able for the long term. I bought the ingredients to make your parsnip rice with caramelized butternut squash yesterday- I can’t wait to make it! I’m going to seek out those kelp noodles. Happy eating! That sounds delightful. Carrots are possibly my favorite food (I always have a ton of them even though I don’t make juice) and I think they go particularly well with avo for dressings. Might be worth mentioning that there’s about 20 calories in an entire package of kelp noodles, so it’s hardly outlandish that you eat the whole thing! I love how you ‘unpacked’ the process of making a delicious meal on the fly based on what’s in the fridge–it’s such a fun way to create. This looks wonderful and I already know I’ll made it as soon as I can find kelp noodles. Have you had any luck locating them in DC? I haven’t, so far, but have had them at Cafe Green and love them. I just ordered kelp noodles, they’re on the way! This will be a great first attempt. I love your lesson, my biggest obstacle is flavor pairings. I’m learning though! Thanks for the tip on creating a balanced meal. I bring my lunch to work every day and I need to get better at making healthier meals. I adore your blog & love your recipes. You mentioned that it’s easy to control how soft or crispy the kelp noodles are. I would love to know how you do this. Mine always turn out a bit too crunchy & I’m not certain how to soften them up. Thanks so much for sharing all your wonderful insights & wisdom. You are a treasure! Great timing, I just bought kelp noodles to try and had no idea what to do with them! Was thinking some kind of almond butter /lime/tamari kind of thing but I’m going to try this one tonight! I adore the vibrant colour of your dressing Gena! Your food is always so pretty. i see you have the same issue as i do knowing what to call those beans…aduki? azuki? adzuki? either way, they are quite tasty. this recipe is starred! Gena- I love the speedy lunches with easy on hand ingredients. Your rolls inspired my lunch yesterday- mixed greens, sunflower seeds, apple, carrots, cabbage, sugar snap peas and ginger miso dressing! I didn’t have any nori, but your combo sound so delightful I had to improvise! Happy Friday! Ohhh I loved that sauce! Made some changes but it was seriously good! Yumm!